Boeing and Airbus delivered a record 83 and 127 commercial jets in December 2017, respectively, compared to 67 and 111 during the same month last year. In all of 2017, Boeing delivered 763 jets (748 in 2016) in line with company expectations, while Airbus surpassed its delivery target of 700 jets by handing over 718 aircraft during 2017 (688 in 2016). In December 2017, Boeing delivered 61 737s (of which 25 were 737 MAXs), well above the current monthly rate of 47 jets. The company also delivered two 747-8s, one 767, eight 777s, and 11 787s. Boeing raised its 737 production rate to 47 per month in Q3 2017 from 42 previously, and plans to increase it further to 52 during 2018. 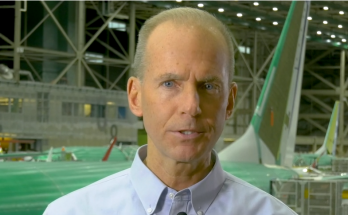 Boeing CEO Dennis Muilenburg has stated that demand supports a further increase to 57 737s per month in 2019. This year more than 50 737 MAX jets are expected to come off the production line in Renton, Washington. With 73 MAX deliveries, Boeing easily exceeded its target. 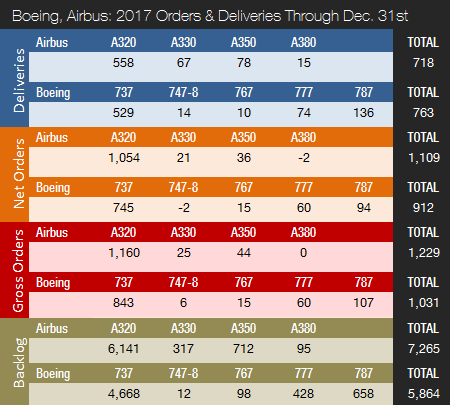 In December 2017, Airbus delivered a whopping 105 A320s (58 ceo / 47 neo), 12 A330s, nine A350s, and one A380. For most of 2017, Airbus struggled with late deliveries of PurePower engines from Pratt & Whitney for the A320neo family of aircraft, but it was able to finish the year on a high note. The company originally expected to deliver 200 A320neos in 2017 and came relatively close – with 181 NEOs shipped. Airbus expected to deliver 80 A350s in 2017 and delivered 78. The company plans to deliver up to 120 A350s in 2018 once the production rate hits 10 per month. Airbus is considering a further increase to 13 A350s per month in 2019. The ramp-up of A350 XWB deliveries combined with a higher A320 production rate of 46 per month (commenced Q2 2016) means that the company is narrowing Boeing’s deliveries lead and could surpass its top rival by 2019 or 2020. By mid-2019, Airbus expects to be delivering 60 A320 jets per month. In December, Boeing logged 265 gross orders (minus 14 cancellations => net of 251). 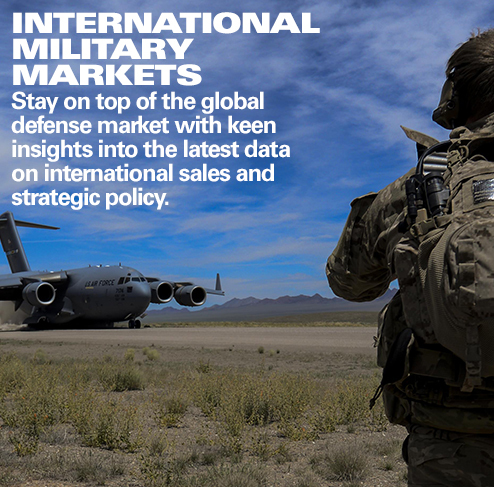 Boeing’s December bookings included the large flydubai order for 175 737 MAX jets announced at the Dubai Air Show in November 2017. On December 20, Southwest Airlines ordered 40 737 MAXs, and an order for 30 MAXs by an unidentified customer followed on December 29. For full-year 2017, Boeing landed an impressive 912 net new orders (1,031 gross orders), compared to 668 net new orders in 2016. However, this was not enough to take back the orders crown from Airbus, as the European rival reported an unprecedented order intake in December. Just as Boeing looked set to win the orders race in 2017, Airbus finished the year on a very high note – booking a whopping 776 net new orders (841 gross orders) in December alone. This was more than double the intake of the first 11 months of the year. This compares to 731 net new orders in 2016. 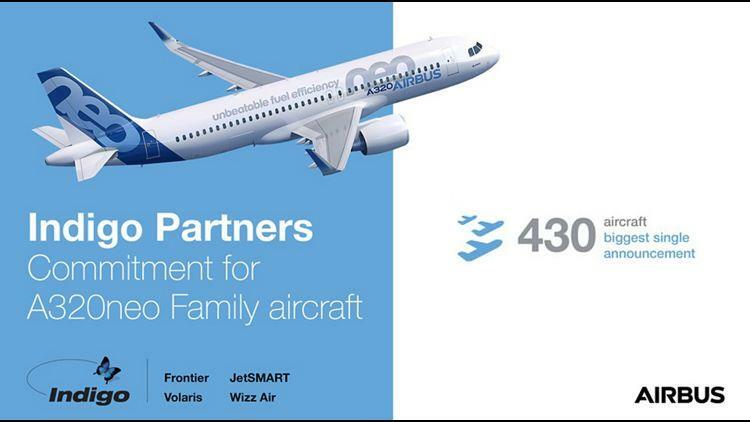 Airbus’ December bookings included the large Indigo Partners order for 430 A320neo family jets announced at November’s Dubai Air Show. Delta ordered 105 A321ceo/neo jets, followed by China Aircraft Leasing Group’s order for 55 A320neo family jets. 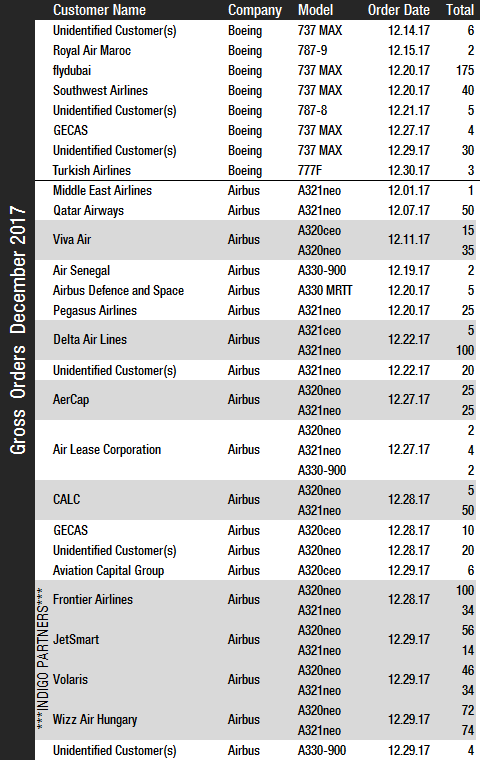 Other major December orders were placed by AerCap (50 A320neo family jets), Qatar Airways (50 A321neos), and Viva Air (50 A320ceo/neo jets). While Airbus won the orders race by number of aircraft, Boeing beat Airbus by order values – albeit narrowly. The reason for that is that Boeing landed 167 orders for the more costly widebody jets in 2017 vs. only 55 for Airbus. 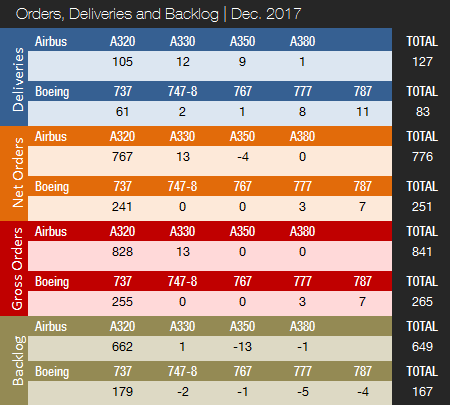 Airbus’ order backlog as of December 31, 2017 stands at 7,265 jets (of which 6,141, or 85%, are A320ceo/neo family narrowbodies), ahead of Boeing’s 5,864 (of which 4,668, or 80%, are 737 NG/MAX narrowbody jets). The number of Airbus aircraft to be built and delivered represents a 10-year backlog at the 2017 production level. In comparison, Boeing’s backlog would “only” last 7.7 years. Airbus’ backlog is at an all-time record of 7,265 firm bookings following an impressive surge in orders in late 2017. This is 391 jets more than the previous record set in December 2016. Airbus booked 1,109 net new orders in 2017, resulting in a book-to-bill ratio of 1.54. Standing at 5,864 aircraft, Boeing’s 2017 year-end backlog narrowly beat the previous record of 5,813 jets set at the end of January 2016. Boeing booked 912 net new orders in 2017, for a book-to-bill ratio of 1.20. Airbus has retained an order lead over Boeing every year since 2012. “For 2017, based on previously announced production rates, the author expects Airbus to easily surpass 700 deliveries and further narrow the gap in production between the two major plane makers. We can expect Airbus to deliver 730-750 jets during the year.” We were pretty much on target here, but Airbus was severely challenged by late PurePower engine deliveries for the A320neo family. With 718 deliveries thanks to an impressive year-end surge, the company exceeded the 700 delivery mark, but that certainly was not an easy feat. Based on the official production rates, Airbus should have delivered 746 jets in 2017. “The key for Airbus is to successfully manage the continued ramp-up in production of the A320neo and A350 and avoid further issues in its supply chain.” A320neo production turned out to be a tough challenge for Airbus in 2017 due to supply chain issues (181 deliveries vs. target of 200), whereas A350 production was almost on target (78 deliveries vs. target of 80). “Boeing can be expected to deliver 770-790 aircraft. For Boeing, the planned increase in production of the 737 and a smooth transition to the MAX are critical.” The company later announced a conservative target of just 760-765 aircraft and ended up shipping 763. However, if Boeing had followed its official production rates one to one, it would have delivered 780 jets in 2017. 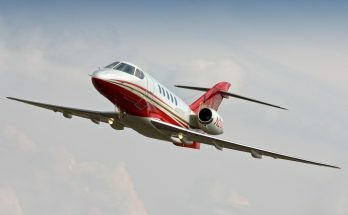 “A level of 400-600 net new orders can be expected.” Clearly, the author vastly underestimated the airline industry’s appetite for more commercial jets, with more than 2,000 firm orders placed in total. 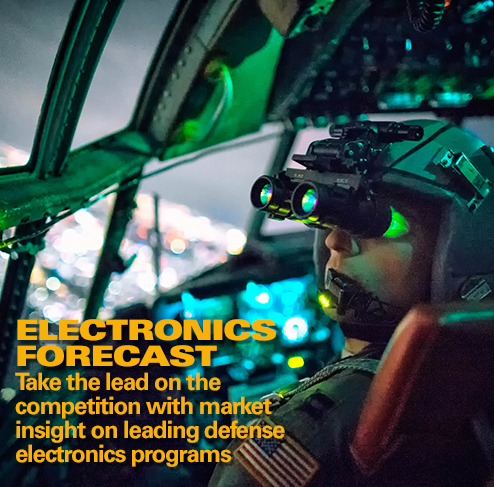 For 2018 the author expects a substantial hike in deliveries from both aircraft makers, and will return with a full forecast in the February report. 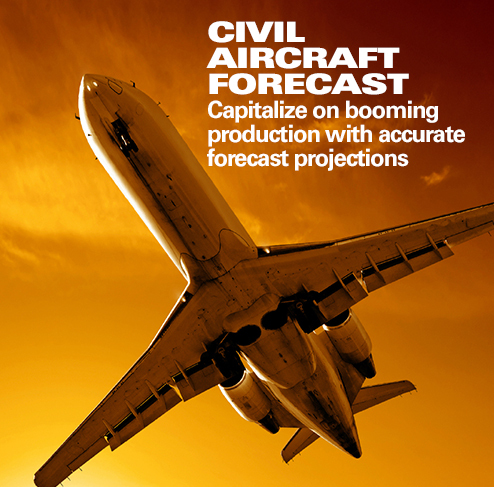 The author’s preliminary forecast is 750-770 deliveries for Airbus and 800-820 for Boeing. These figures are conservative and based on production rates minus ~5 percent. No official targets have yet been set by Boeing and Airbus. We can expect both manufacturers to report modest January deliveries – Airbus in particular. As we witnessed in 2017, orders can be very hard to predict, but a cautious preliminary forecast for 2018 is a level of 600-800 net new orders for each plane maker.